MOSCOW (RFE/RL)—An Armenian army unit participated in Saturday’s massive Russian military parade in Moscow held on the 70th anniversary of victory over Nazi Germany in World War II, which was also officially marked in Armenia. The 64-strong unit and similar contingents from Azerbaijan, several other ex-Soviet states as well as China and India joined as many as 16,000 Russian soldiers in marching through Red Square. The parade, the biggest show of Russia’s military might since the Soviet collapse, was boycotted by the leaders of major Western powers because of Moscow’s role in the conflict in Ukraine. But about two dozen other world leaders, including President Serzh Sarkisian, chose to watch it alongside Russian President Vladimir Putin. Putin and his foreign guests, among them the presidents of China, Cuba and Venezuela, went on to put flowers at the nearby Tomb of the Unknown Soldier built in memory of an estimated 27 million Soviet soldiers and civilians killed from 1941-1945. 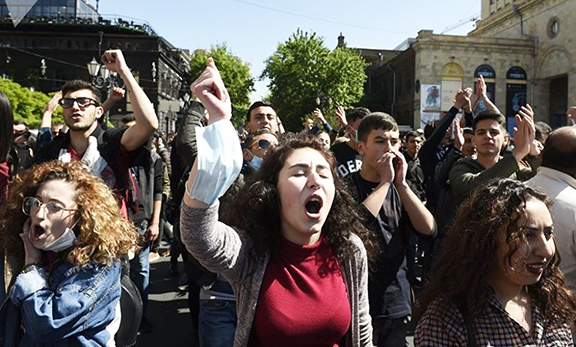 May 9 is also a public holiday in Armenia officially called Day of Victory and Peace. As always, the main official ceremony to mark the victory anniversary was held in a World War II memorial in Yerevan’s Victory Park. Several hundred Armenian and Russian soldiers marched there before Russian fighter jets and combat helicopters roared overhead. Like other peoples of the Soviet Union, Armenians contributed significantly to the Soviet defeat of Nazi Germany. Sarkisian touted that contribution in a written address to the nation issued on the occasion. Some 300,000 residents of Soviet Armenia — more than one-fifth of its 1941 population — as well as over 200,000 ethnic Armenians from other Soviet republics were drafted to the Red Army during the war. Nearly half of them were killed in action. Many fought in six predominantly Armenian divisions formed by the Soviet military. One of those divisions was among the Soviet troops that stormed and captured Berlin in April-May 1945. The wartime Red Army also had several dozen Armenian generals. The most famous and senior of them, Marshal Ivan Baghramyan, is buried in Red Square. Sarkisian, whose office is located on a Yerevan avenue bearing Baghramyan’s name, laid a wreath at his tomb later on Saturday. admirals in the Soviet Army. They had more than 100 Soviet Heroes etc. They honoured their own who sacrificed their lives for freedom.